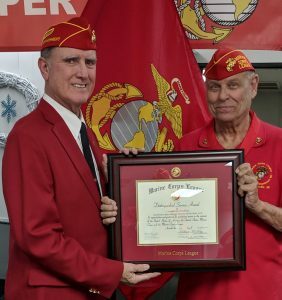 Marines we meet on the third Monday of each month at 1900 at the VFW Post 4012, 438 S. Main St., Northville, MICH.
Do you have a young boy or girl who is looking for a challenge? A purpose? Check out the Young Marines Program. 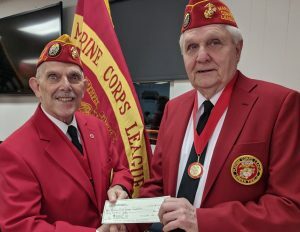 Detachment Commandant Norm Root Jr. presents Unit Commander Ron Mason with a donation of $200 at a regular meeting of the detachment in November 2018. 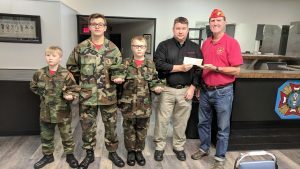 MCL Northwest Detachment Commandant Bill King presents MCL Michigan Foundation president Jerry McKeon a check for $150 for the scholarship fund. Join our Email List to learn when our events will be in the future. Guests are welcome to join us at any of our meetings or events. Come visit with your fellow Marines or with like minded individuals. We seek to serve our community.